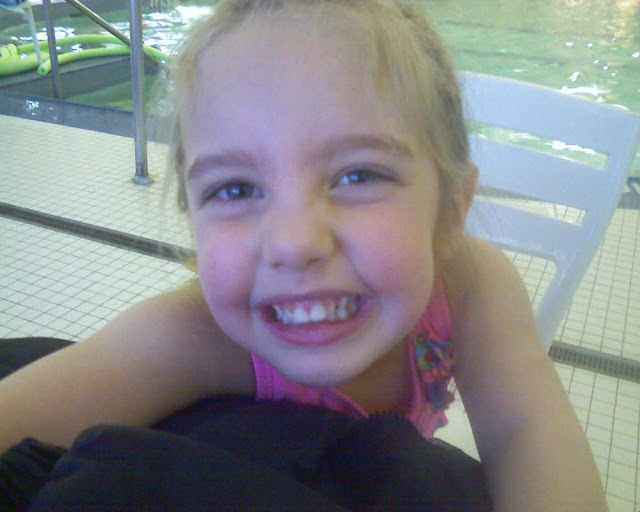 Grace just finished her 3rd swim lesson last night. We take her down to the City of Dublin Rec. Center. There are 3-4 other kids in her class. Right now they are basically just learning how to blow bubbles with their mouths, go all the way under, kick, move their arms properly, and float on their backs (with the help of a water noodle). She is enjoying the class, but I have to say that Shawn and I could probably do just as good a job teaching her. We think that it is very important for her to learn how to swim early since we live next to a pond!